White sharks are media darlings, but the coastal and open ocean waters of southern New England also host a number of other shark species, from the year-round porbeagle to summertime visits by tigers and hammerheads. In late spring and early summer, various species of sharks migrate north from their southern wintering grounds. In fact, no fewer than a dozen shark species migrate in and out of southern New England’s waters annually, according to the Massachusetts Marine Fisheries’ Shark Research Project. Southern New England represents the northernmost range for several shark species, making the region an important area for monitoring the health and distribution of shark populations. Sharks are uniquely distinguished from other fishes by their cartilaginous skeleton, five to seven gill slits, and sandpaper-like scales, according to the Shark Research Project. They have evolved over 400 million years and the modern species have changed little since the time of the dinosaurs. The evolutionary success of these animals can be attributed to their unique adaptations. They possess at least six senses finely tuned to navigate, communicate and detect prey. Their multiple rows of sharp teeth are replaced continually to ensure efficiency, but their collective threat to humans is negligible. In fact, humans are a much bigger threat to sharks. Some 100 million sharks are killed annually by humans, according to shark researcher Brad Wetherbee, a biology lecturer in the University of Rhode Island’s College of the Environment and Life Sciences. Many of these sharks are killed for their fins, which are hacked off, often from live sharks, to be used in shark fin soup. Sharks also are harvested for their cartilage, liver oil and meat. There are close to 500 species of sharks worldwide, Wetherbee said. They range in size from the 8-inch dwarf dogshark to the 60-foot whale shark. Their habitat ranges from coastal areas to the open ocean, from Arctic waters to tropical seas, from surface waters to abyssal depths. ecoRI News recently spoke with Wetherbee about the kinds of sharks — excluding the star of “Jaws” — swimming in the waters off southern New England. Spiny and smooth dogfish. Despite sharing the same surname, these two coastal shark species aren’t closely related. Dogfish get their name because they often travel and hunt in packs. Both species migrate into the area in the warmer months, and a few remain through the winter. They have little teeth, and can grow to be 5 feet long. Spiny dogfish can arch their backs and inject venom into predators from their dorsal spines. Thousands are harvested annually for use in U.K. fish and chips. The Atlantic spiny dogfish fishery is the largest shark fishery in the United States. Sandbar shark. This coastal shark species — also known as the brown shark — migrates to the region in the summer. They can grow to be 8 feet long, and “they have sharp teeth that can do a lot of damage if you get bitten.” They can be caught from the beach or a boat. Often found in harbors, bays and the mouths of rivers, sandbar sharks prefer protected waters and smooth, sandy bottoms. Adults have few predators. 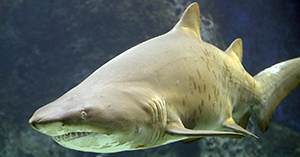 Sand tiger shark. This coastal species is closely related to white and mako sharks. In the summer, they can be found in Narragansett Bay, around Block Island, and off Point Judith and Napatree Point. They can grow to be 10 feet long. They swim slowly, are easy to keep in captivity and can be seen in aquariums throughout the world. Although this species is widespread and isn’t widely fished for food, it has one of the lowest reproduction rates of all sharks — the young cannibalize each other in their mother’s womb. Sand tigers are listed as vulnerable and they are protected in much of their range. Blue shark. These oceanic sharks are long and skinny and can grow to be 13 feet in length and weigh 450 pounds. These “beautiful” sharks are excellent swimmers. Mating between males and females is violent, as the males often bite the females. To withstand the violence of mating, the female's skin is three times as thick as that of their male counterparts. Although not good to eat, blues are the world’s most fished shark species. They are harvested for their fins, skin, tails and flesh. Their teeth and jaws are also harvested for commercial uses. Mako shark. This oceanic species is one of the fastest fish in the ocean, with speeds up to 40 mph or so. They also are a popular seafood worldwide. They can grow to be 12 feet in length and weigh up to a 1,000 pounds. Their range is large, which makes studying makos difficult. These sharks are considered one of the great game fishes of the world, and their flesh is considered among the best to eat. Mako sharks are a common bycatch in the tuna and swordfish fisheries. Thresher shark. This oceanic species is rarely seen near shore, and can jump out of the water if provoked or threatened. They can grow to be 18 feet long, but half that length is tail. Their tails alone can weigh up to 750 pounds. Thresher sharks have been observed to use their long tails to herd, disorient and stun prey at or near the surface, and they are often caught on longlines tailhooked. They can live a long time (20–50 years), reproduce late in life and only have a few young at a time. Their range is large. Basking shark. This oceanic species is a filter feeder, swimming with its mouth open as water — filled with plankton, small fish and fish eggs — flows through. An adult shark can process more than 1,500 gallons of water an hour. These sharks have hundreds of tiny teeth. They can grow to be 45 feet in length and can weigh up to 4 tons. It’s the second-largest shark, after the whale shark. Basking sharks have very low reproductive rates and are one of the more vulnerable species to overfishing. They are slow swimmers, going no more than 3 mph. Hammerhead shark. This tropical species makes an occasional appearance during the region’s warmest months. They can grow to be 18 feet long and weigh up to a 1,000 pounds. Their wide-set eyes give them a better visual range, and by spreading their highly specialized sensory organs across their mallet-shaped heads, they can more thoroughly scan for prey. They feed on crustaceans, teleosts, cephalopods and rays. Hammerhead shark populations have suffered tremendous commercial fishing pressure from both target and bycatch fisheries. Tiger shark. This tropical species passes through local waters in the summer. They can grow to a length of 15 feet and weigh up to 1,400 pounds. Tiger sharks are named for the dark, vertical stripes found on juveniles. As the sharks mature, the lines begin to fade. Tiger sharks have sharp, highly serrated teeth and powerful jaws that allow them to crack the shells of sea turtles. They have extremely low reproduction rates. Dusky shark. This coastal species, also known as black or bronze whalers, are long-distance swimmers known for seasonal migrations. These sharks can live up to 50 years, but they are slow to grow and to reproduce. They can reach a length of 10 feet and weigh up to 400 pounds. Dusky sharks are heavily targeted for trade in the shark fin soup industry. Catches of dusky sharks have been prohibited in both U.S. commercial and recreational fisheries since 2000. Porbeagle shark. This is a species of the mackerel shark and is a close relative of the salmon shark. Porbeagles grow to be 8 feet long and weigh up to 300 pounds. They prey mainly on cephalopods and on herring, mackerel and lancetfish. This shark is able to change its body temperature quickly, enabling it to adapt to a wide range of water temperatures. Aggressive fishing in the 1950s and '60s resulted in their dwindling numbers. They are still a species of concern. Porbeagles are opportunistic feeders. Their diet consists of teleosts (bony fish), pelagic fish such as lancetfish, herring, sauries and mackerels, and groundfish such as sand lances, lumpsuckers, flounders, hakes and cod.